Last month we shared a beautiful, St. Paul remodel, our Lincoln Ave. project. Many of you fell in love with this clean, traditional home but, little did you know, we were keeping one space from you! 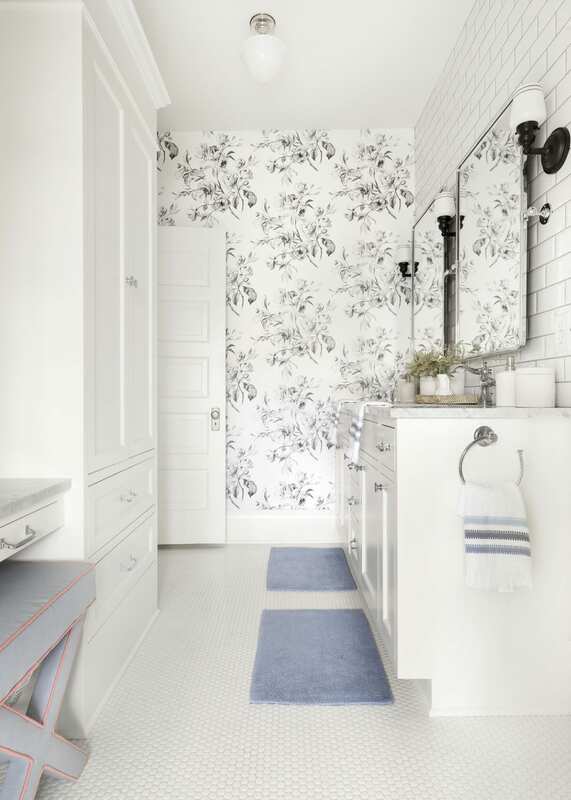 The bathroom we designed for our client’s daughters is so charming that we thought it deserved the spotlight and a post of its own. Anytime we’re in charge of creating a space for a child, we know it’s going to be fun. Typically it means we get to play around with pattern, color, and a bit of whimsy – what’s better than that? For this space, our clients really let us run free and only had one request: not too juvenile and not too adult – something their girls could grow with. Challenge accepted! The bathroom was a complete remodel which allowed us to also modify the layout of the space. The new floor plan featured ample storage, double sinks, a large shower with a separate claw foot tub, plus a vanity that the girls can look forward to using more and more as they grow older. Our clients love to have a bit of fun with design, which is always music to our ears. Because of this, we decided to install an incredible, black and white, floral wallpaper on one of the walls. 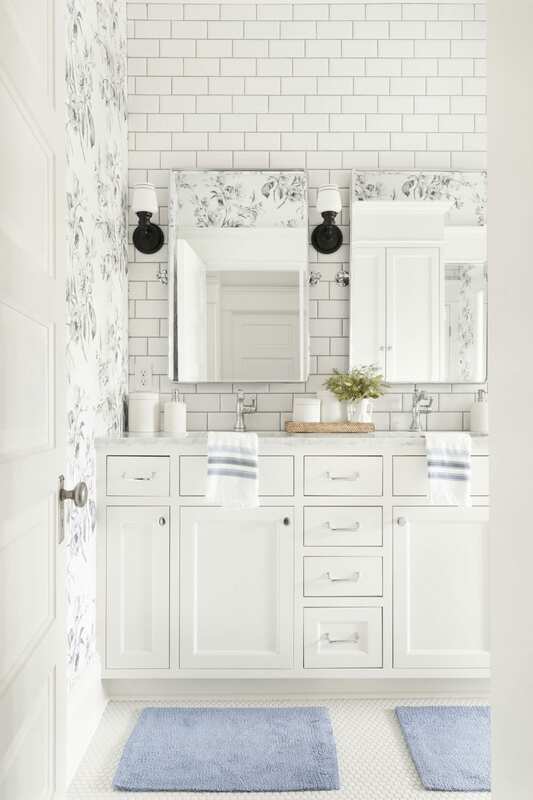 Paired with the subway tile backsplash that goes all the way to ceiling, these two details made a huge statement in the room while still keeping it neutral and serene. We chose to incorporate color in the accessories (i.e. bath mats, towels, artwork, etc.). To keep it light and calm, we went with softer blues and blushes and we couldn’t love this color combination more. Rather than risk an outdated space in a few years, we like to go with temporary tricks like selecting accessories in the kids favorite colors which are easy to swap up when their taste changes! If you’re looking to create a room like this for your little (or even more grown up!) girl, we made it easy for you to shop too the look. Click on the product images throughout this post to see where we got a few of the pieces from this darling space.